Using the same baking soda found in most grocery stores, we and our colleagues from Harvard University and the University of Illinois at Urbana-Champaign, have created a significant advance in carbon dioxide capture. 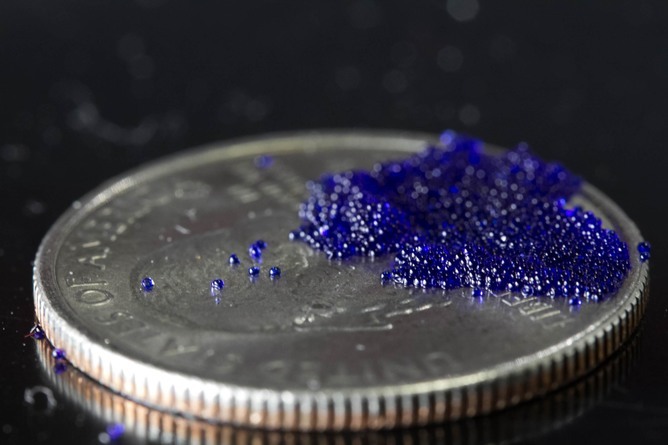 We developed a new type of carbon capture media composed of microcapsules, tiny capsules designed to separate carbon dioxide in flue gases from power plants and other sources of emissions. Our approach offers a number of advantages over current methods. The capsules are made of a highly permeable polymer shell, similar to what you find on a red kitchen spatula. Inside them is a fluid with sodium carbonate, a common chemical with many industrial uses. The sodium carbonate reacts with carbon dioxide (CO2) and transforms into harmless, stable sodium bicarbonate – the main ingredient in baking soda, the baking ingredient found in most kitchens. The capsules keep the liquid contained inside the capsule core and allow the CO2 gas to pass back and forth through its shell. During absorption, the CO2 diffuses through the thin capsule shells. Then, the gas dissolves and reacts in the liquid core to form the desired baking soda. To extract the gas from the tiny capsules, the microcapsules are heated, which releases high-purity CO2, which can subsequently be compressed for storage or utilization. Once the CO2 is removed, the capsules can be reused. To date, microcapsules have been used for controlled delivery and release of pharmaceuticals, food flavoring and cosmetics. But this is the first demonstration of this approach for controlled CO2 capture and release. The aim of carbon capture is to prevent the release of large quantities of CO2 — a greenhouse gas that traps heat and makes the planet warmer — into the atmosphere from burning fossil fuel for power generation and other industries. However, currently used methods, while successful, can be harmful to the environment. One well established carbon capture method is to use chemicals called amines to chemically react with CO2 and thus separate it from effluent gas. Our method is more environmentally benign because it uses carbonates rather than caustic fluids, such as monoethanol amine, to capture CO2 – a key attribute of our research. The capsules on a quarter for scale. Also, the microcapsules only react with the gas of interest (in this case CO2). 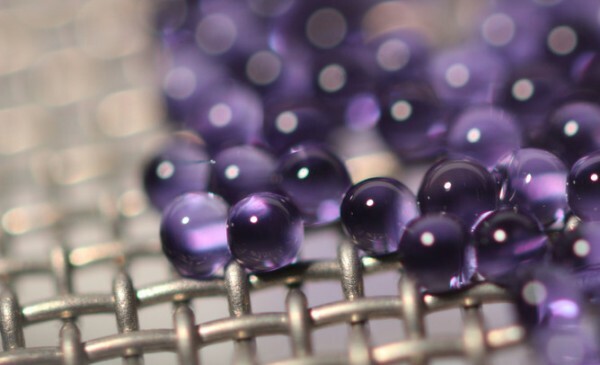 The encapsulation process was developed as one of the Department of Energy’s inaugural Advanced Research Projects Agency-Energy (ARPA-E) innovative carbon capture projects. The new process can be used in a wide range of situations. It can be designed to work with coal or natural gas-fired power plants, as well as in industrial processes like steel and cement production. The technique is not a single, short-term solution to carbon capture, but a broad, sustainable approach. The sodium carbonate used in the process is mined domestically, rather than being made in a complex chemical process like the current technology of amines. In addition, baking soda has no recycling or degradation issues. It can be reused forever because the capsules are mechanically robust, while amines break down in a period of months to years.